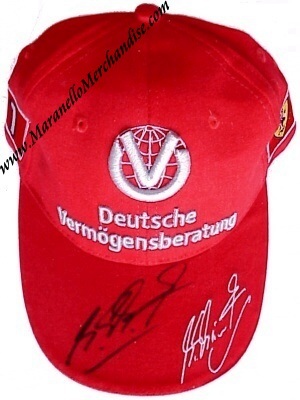 Michael Schumacher signed 2002 DVAG Platinum Cap. This is a BRAND NEW, never worn, 2002 DVAG sponsor cap, made after Michael achieved his 4th F1 World Title in 2001 and Michael wore such caps throughout the 2002 season. Michael has personally autographed it on the peak with a black marker.